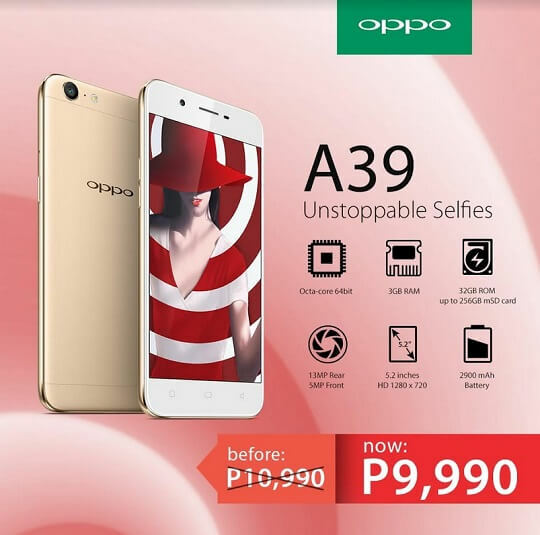 Just around two months after it lands the local market, OPPO Philippines announced that they are slashing the price of OPPO A39 from Php10,990 to Php9,990, that is about 1000 pesos savings, making it more affordable and attractive to potential buyers. The OPPO Philippines says that its their early summer treat for smartphone shoppers, but we think this is a response to counter the aggressive pricing of Vivo V5 Lite, which has lots of similarities in terms of specs with the OPPO A39. Moreover, there is no mention whether this is a limited-time promotion, so more likely, it will be a permanent price cut. As a refresher, this handset offers a 5.2-inch IPS display with HD resolution and Corning Gorilla Glass 4 protection on top. On the inside, it is powered by octa core MediaTek MT6750, the same chipset found on the OPPO F1s, paired with 3GB of RAM and 32GB of expandable storage. In the camera department, the back holds the 13MP phase-detection auto focus main shooter, while the front is equipped with 5MP snapper for taking selfies or groupies. For the complete specifications and more information, you can read our original post about this device HERE.